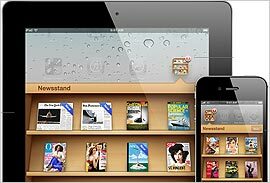 Magazine publishers are reporting spikes in digital subscriptions and single-copy sales of digital editions since the launch of the Newsstand feature in Apple’s iOS 5. The new section, which allows users to find digital magazines and newspapers in one dedicated area in the App Store, then organize subscriptions on a virtual bookshelf, debuted two weeks ago along with the iPhone 4S. Since then, Conde Nast said new subscription sales per week across all nine of its iPad editions increased 268%, compared to the previous eight weeks. Single-copy sales were up 142%. The surge spans various titles, including Allure, Brides, Glamour, Self, GQ, Golf Digest, The New Yorker, Vanity Fair and Wired. Likewise, Bonnier has said it has also seen an immediate impact from the debut of Newsstand. Since the feature launched with iOS 5 on Oct. 12, the publisher’s iPad versions of Popular Science and Popular Photography have sold about 500 and 600 subscriptions or single copies a day, respectively. Previously, they had averaged about 500 to 100 per day. “At this point, we think Newsstand is a game changer,” said Gregg Hano, vice president, group publisher of Bonnier’s technology group. Conde Nast did not provide any figures for actual subscription totals in the wake of Newsstand’s arrival. Back in August, the company announced having 242,000 digital edition customers six weeks after introducing subscriptions in the App Store. In addition to subscriptions, that figure included digital single copies and the 136,000 print subscribers who added digital editions. Publishers had been counting on Newsstand to provide a lift to their digital subscriptions since Apple announced the new feature in June. It provides a more high-profile venue for companies to market their wares than they have had in the past. As new issues become available, Newsstand automatically updates them in the background, showing the latest covers.